Point of a Million Connections: Tantalizing Quotes from "Decolonizing Food"
"As a result of destroyed livelihoods in their countries of origin due to free-trade-facilitated corporate expansion (in which Canadian multinationals are often complicit), thousands of farmers come from Mexico, Guatemala and elsewhere to work in Canada’s SAWP. Canada creates and perpetuates an unjust situation for these farm workers, who are usually poorly paid, given harsh accommodation and denied access to services...how do we make these spaces safe for the most marginalized among us while also building an effective resistance to the systems that create and perpetuate food injustice?" Maryam Adrangi and Laura Lepper, "Food for all! 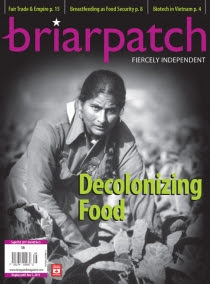 Food justice needs migrant justice"
"Farming, in my experience, is too rich, too complex, too full of pleasure and agony to be learned from a distance. You need to wade ankle deep into mud, gorge on warm berries, toss bales until your fingers bleed. Farming as an art is interconnected and complex and requires a method of instruction that reflects this essence." - Anna Kirkpatrick, "Learning to grow: The proliferation of hands-on educational opportunities for wannabe farmers"
"The need for commercial, artificial human milk has been manufactured through the same intentional degradation of community that has manufactured doubt in our ability to produce milk from our breasts or food for our tables. It is not at all surprising that the years that saw dramatic decreases in breastfeeding are the same years that we gave up more and more of our gardens, our chickens and our recipes in exchange for supermarket solutions. We have been told that the work required to feed ourselves and our infants is drudgery and that time spent washing bottles and standing in line at the till is freedom." - Erin Laing, "From apple pie and mother's milk to pop-tarts and formula: How will we feed the next generation?" These are tantalizing indeed! And resonate, especially the bottom two, with much of my thinking the past little while.